A Multimedia Conference that frees the cone in you! For the second time, people from the VideoLAN community will meet in Paris to gather, work, discuss and build a stronger community, on the 18th, 19th and 20th of december 2009. Developers, designers and anonymous people around VLC, DVBlast, VLMa, skin-designer or other multimedia projects will be there. There are public and technical events. On Friday 18th december 2009 at 18h30, the VideoLAN project invites you to come to La Cantine and discuss with the VideoLAN teams. Presentations about VideoLAN, the next version of VLC and new projects will be held. Registration are online on the la cantine website. For the French libre community and activists or technology-oriented people that are interested, there will be technical presentations about VLC on the Saturday 19th december 2009 at 17h30 at Epitech. We will then go and eat together in a restaurant. The VideoLAN community will meet during 3 days, in order to develop the community around the cone. 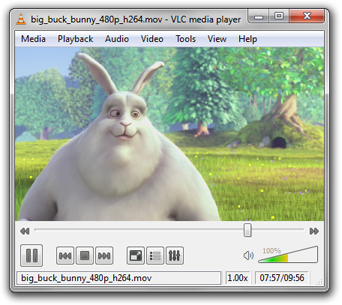 We want to build a better future of VLC and other projects. Anyone that cares about some VideoLAN projects. If you are not a technical person, but an enthusiast, we recommend to come to the less technical events, especially at La Cantine. On the 18th, 19th and 20th of december in Paris. Technical events will be at Epitech. You can find the full final schedule here. If you want to come to join us, please mail us for your registration. Note that the saturday conferences don't need registration. Anevia is sponsoring the party at La Cantine. Epitech is hosting most of the events and sponsoring some part of the event. Help us organizing the event!